The light is a white octagonal concrete tower with a red upper portion, 42 feet (13m) high. Sources: List of Lights 1989, NSLPS database, Sailing Directions, Gulf and River St. Lawrence, 1985. The original tower was constructed in 1937. The concrete tower replaced it at some time between 1955 and 1962. The lighthouse was automated in 1988. 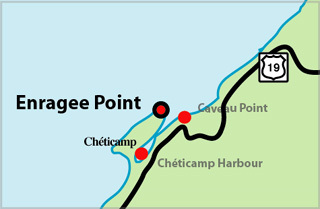 The town of Cheticamp is on the west side of Cape Breton Island. 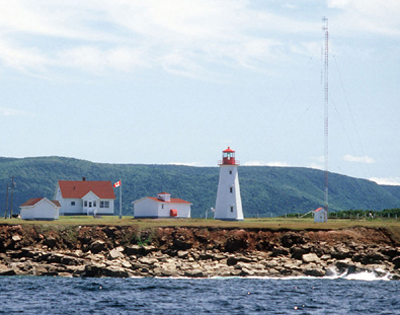 The light stands on the northwest point of Cheticamp Island. The island is joined to Cape Breton Island by a narrow beach of sand and shingle at the south end. The coast of Cheticamp Island is a high cliff which is constantly being undermined by the sea.